Keeping your Mercedes-Benz vehicle's interior clean in any weather is important. 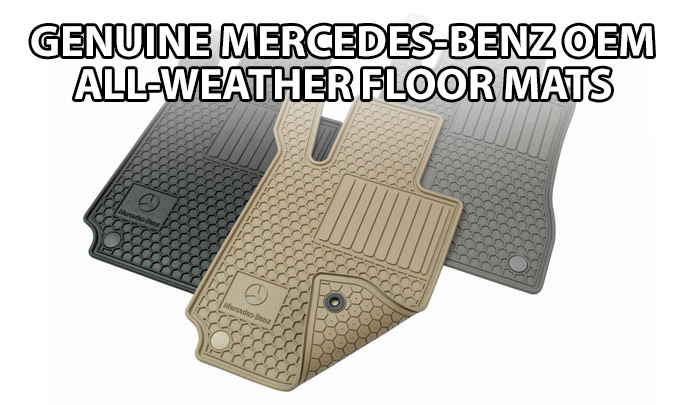 That's why we offer these genuine Mercedes-Benz all-weather floor mats. Unlike non-OEM floor mats, these floor mats are specifically designed to fit your Mercedes-Benz vehicle. These genuine Mercedes-Benz all-weather floor mats come with a heavy duty construction and a honeycomb design with deep channels that offer protection from snow, water, dirt and mud. They'll keep your carpet free from staining or soiling. They're easy to clean too!